Today we are happy to be able to bring you another dev blog discussing the ongoing improvements to EVE Online’s war declaration system. 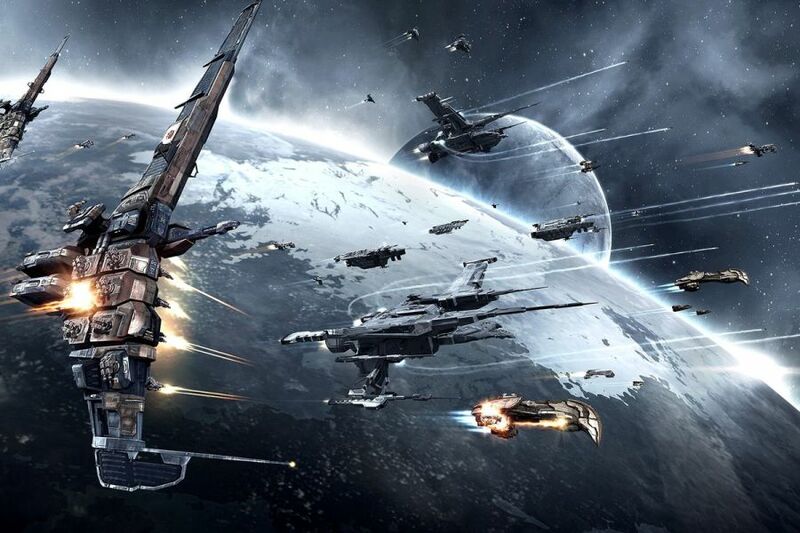 If you’ve been following the last few months of EVE’s development then you’ll already know that we are in the midst of a major overhaul of war declarations with the goals of encouraging the sorts of wars that provide entertaining conflicts between corporations and alliances while reducing the number of situations where players experience a lack of viable choices or feel forced into avoiding joining player corporations entirely. We deployed a first round of changes in the December 2018 release, and since then we have been watching and listening to player reactions, evaluating options for next steps, and discussing our early plans with the CSM. We are now ready to start gathering wider community feedback on our wardec development plans for the rest of the spring. These plans build upon the changes released last December, and include a sequence of improvements to be deployed across the patches in March, April, and May of this year. The focus of our first round of changes released last December was to give players more opportunities to control their exposure to the war declaration system without needing to stay in NPC corps. Since December all corporations/alliances that own at least one structure in space are considered “war eligible”, and groups must be war eligible to participate in the war declaration system as either an attacker or defender. All the details of these changes can be found in the dev blog we published on December 6th. Since the release of these changes last year we have been watching closely to see how they have impacted the game and how the community has been experiencing them. The feedback on these changes we have been hearing from the community has been tentatively positive, with a lot of players waiting to see what the follow up pass will contain. On the metrics front, we also have some evidence for cautious optimism. For some areas of investigation we will need significantly more data before drawing conclusions, but there are some areas where we can see a clear impact. One of the constant frustration points among both sides of war declarations has always been the lack of conflict seen in many wars. As much as possible we want to encourage the types of wars that will generate pvp rather than one or both sides staying docked. We still have significant room to improve in this area, but the December changes which ensured that both sides of every war must have a vulnerable structure somewhere in space to defend have caused a clear improvement. We have seen a significant rise in the percentage of non-mutual wars that get at least one pvp kill in a given day. 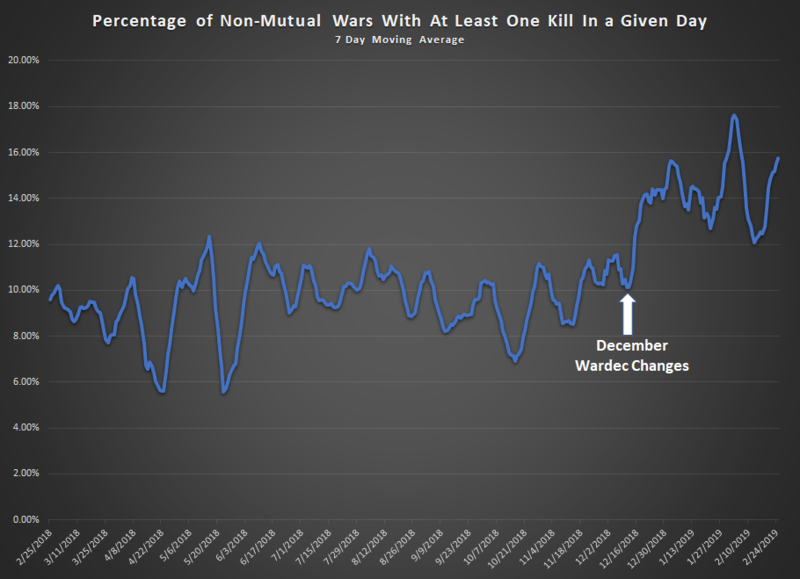 The number of total pvp kills across all wars has also gone up, but that particular number is strongly influenced by the current Perimeter trade hub conflicts so we don't consider it to be a reliable indicator of the impact of the December changes (at least until we get data from a substantially larger period of time). We have also been aiming to remove any barriers preventing new capsuleers from joining player corporations and alliances. We don’t want to force players to join corporations if they don’t feel interested, but as EVE players ourselves we know from experience how much a good group of allies can improve the game. Any time a new player who wants to join a corporation gets blocked from that goal by some aspect of the game we consider that a missed opportunity and a problem that should be fixed. 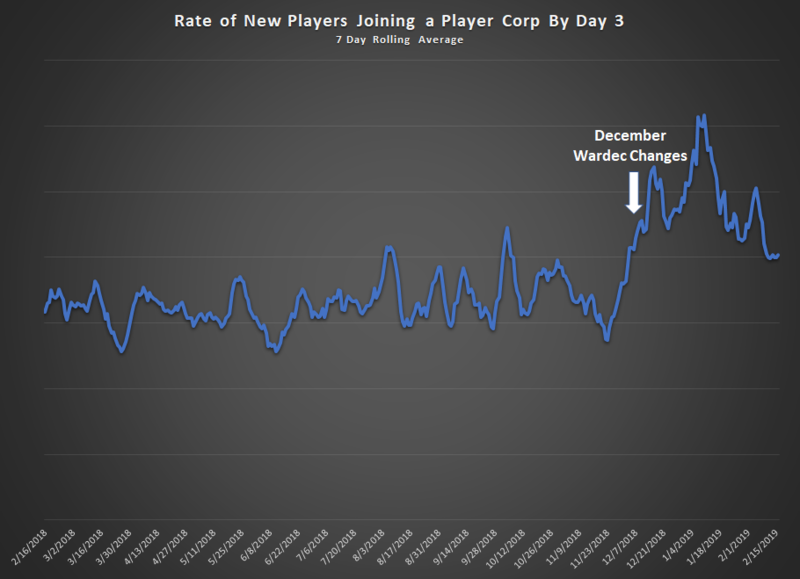 As such, we consider the recent increase in the percentage of new players (not including alt accounts) joining a corporation in their first three days to be a good sign. The December changes were only the start of this project, but we are cautiously optimistic that they may have been a positive step forward. Our current plan is for the upcoming war declaration improvements coming this spring to build upon the December changes. The upcoming March release will include some of the highest priority fixes intended to close unintended loopholes that allow players to gain short-term immunity from certain war declarations. These loopholes are currently disrupting warfare over high value assets in highsec and we want to get them cleaned up in a timely fashion. The first of these loopholes is one that we have referred to as the “headfake” trick internally. There are a few ways for corporations to get themselves into this situation but the end result is always a corporation intentionally getting itself into an expiring war against a specific opponent and then using the 24 hour warning period of any newly declared war as a period of planned invulnerability to deploy a structure. Corporation A uses one of several methods to intentionally get itself into a war with Corporation B that is declared invalid for any reason and then enters its 24 hour cooldown period. Corporation A deploys an Upwell structure in highsec during this 24 hour war cooldown. Although shooting is allowed during the 24 hour cooldown, Corporation A counts on the fact that Corporation B cannot find their new structure within the 15 minute initial deployment vulnerability. This new war requires 24 hours to take effect, during which time shooting is not allowed. This means that Corporation B cannot shoot Corporation A’s new structure when it finishes deploying and enters its onlining vulnerability period. Corporation A has successfully used a loophole in the war declaration system to protect their new structure’s crucial onlining vulnerability period from a specific opponent. To close this loophole we are changing some of the mechanics around the 24 hour cooldown period at the end of wars. After the March release, either side of a war that is within its 24 hour cooldown period can choose to declare a new war instantly to replace the old one. This new war is subject to the same billing and eligibility requirements as any other war, but instead of starting a 24 hour warmup period it will begin instantly with shooting allowed. Since both the attacker and defender of this new war will already be able to shoot at each other thanks to the old war, there is no need for the 24 hour warning period. If the scenario described above were to occur after these changes Corporation B could declare a new war during the 24 hour cooldown of the old war (once the deployment of the new Upwell structure makes Corporation A war eligible again) and freely shoot Corporation A’s new structure during its onlining vulnerability period. Another unintended loophole in the war declaration system is something that we refer to as the “war inversion” trick. This loophole allows a corporation to essentially switch sides of a war, turning a defensive war into an offensive war through joining and leaving an alliance under specific conditions. To close this loophole we are preventing corporations that are defenders in an active war from joining an alliance that is the attacker in another active war against the same group attacking the applicant corporation. In this same release we are also fixing a more obscure and irregular bug that would sometimes cause a corporation to become immune to wardecs until downtime. This one isn’t as easy to reliably reproduce or exploit because it depends on some specific configurations of random server node allocations behind the scenes but it would occur rarely and sporadically from a player perspective and when it occurred it would often be confused with the other two issues listed above. All three of these fixes are running on our Singularity test server right now, and are scheduled for deployment to the live Tranquility server with the March release in a few weeks. Following the round of high priority loophole closures and bugfixes in March, we are also prepping a set of changes to the mechanics around highsec “neutral assistance” for the April release. As well, area of effect command bursts currently apply to every member of a pilot’s fleet that is within range, without distinction for whether those fleet members are at war. In both of these cases, the resulting gameplay can be frustrating and unfun as combatants cannot effectively engage neutral repair ships until they activate their modules and cannot engage neutral command bursting ships at all without incurring CONCORD’s wrath. Recently the bulk of the community feedback we’ve been seeing on these particular issues has been in favor of making direct changes to remove these tactics. After the April release, the penalty for direct targeted neutral assistance meeting the conditions above AND occurring within highsec will become a criminal flag and CONCORD response. The safety system will prevent the activation of the targeted assistance modules under these conditions, so we suggest that support pilots in highsec engage their safety at either green or yellow levels to prevent unintentional CONCORDOKKEN. For area of effect command bursts we are approaching the problem a little differently as you may want to continue boosting the members of your fleet that are not involved in a war. Therefore, after the April release neutral command bursts will simply not affect a pilot that meets the conditions listed above when activated in highsec space. The increased penalty for neutral targeted assistance will also apply to limited engagements (such as those caused by duels) but for performance reasons we won't be preventing command bursts from applying to pilots in limited engagements. Neither of these changes impact assisting your corpmates or alliancemates in a war (since you’re in the same war as them), and neither of these changes apply to lowsec (the penalty for targeted neutral assistance in lowsec will continue to be a suspect flag just like today). The most significant and expansive of our upcoming changes are currently planned for the May release. The May changes are intended to provide clearer and more specific goals for defenders in war declarations, as well as improve the clarity, understandability, and user experience around all aspects of war declarations. After the May release, whenever a corporation or alliance declares a non-mutual war they will be required to select a specific Upwell Structure (only including Upwell structures with docking facilities, not FLEX structures) they own somewhere in highsec space. This structure will be designated the “War HQ” for the war. If the War HQ leaves space for any reason (such as unanchoring or destruction) the war becomes invalid and will enter its 24 hour cooldown just as it would if one side lost their war eligibility or if the attackers fail to pay the war bill. If the corporation that owns the War HQ leaves their alliance, the war involving the alliance will enter the 24 hour cooldown and the new war spawned between the leaving corporation and the target will continue to be valid. If a war ends due to the War HQ going away, the former attackers will be unable to declare a new war against the same former defenders for two weeks. This enforced peace is fairly similar to the one that occurs after a war surrender, with the one major difference that it will not prevent the former defenders from declaring a new war against their former attackers. Corporations or alliances with multiple outgoing wars may choose to spread out the War HQs for their wars across multiple structures or use the same structures as HQs for multiple wars as they wish. It will not be possible to change the War HQ once a war has been declared. War HQs are required for the attacking side of a war, but they are not required for defenders (defenders will continue to need to be war eligible) or allies. The identity of the War HQ structure for a war will be public information available in the war report window as well as sent directly to the defenders when the war is declared as a reminder. The primary intent of these changes is to provide a specific and clear goal for defenders in a war. They have the option of choosing to attack the attacker’s War HQ, hiring mercenaries to take the structure down for them, or banding together with other organizations to help them defeat the attackers. For attackers, the War HQ can serve as a way to attract PVP engagements. They will know that the HQ will likely be a primary target for their opponents and can plan their defense appropriately. We hope that these changes will build upon the ones in December and earlier in the spring to help encourage the kinds of wars that provide real conflict rather than pure evasion. Wars that are active before the May release will continue to operate without a war HQ for a set grace period, after which they will become invalid and will need to be re-declared under the new rules. The length of this grace period is still being decided and we’ll keep you all up to date as we get closer to the May release. where N is the number of characters in the defending corp/alliance, and with a minimum cost of 50m isk per week and a maximum cost of 500m isk per week. which is a lot easier to calculate in your head. Not coincidentally, 100 million isk is quite close to the average war bill over the past few months. Beyond the simplification benefits, this change will push the incentives slightly towards declaring war against larger organizations which we hope will combine with these other changes to encourage more PVP and destruction in New Eden’s wars. We are also planning a major set of improvements for the process of starting and managing mutual wars. Currently starting a mutual war requires one side to begin an offensive war and then the defending side to make the war mutual. This means groups need to deal with aspects of war eligibility and costs at the start of a mutual war even though those elements stop mattering once the war has become mutual. We want to make the process of running mutual wars as smooth and understandable as possible, and to reach this goal we are splitting mutual wars into their own UI with a unique process for starting and ending the mutual wars. After the May release, mutual wars will be started through an invitation and acceptance process similar to how corp/alliance applications work. One corp or alliance will be able to send invitations for a mutual war to other corps or alliances and the organization that receives the invitation can choose to accept or decline the offer. Mutual wars will not require any ISK costs, war eligibility, or War HQs. Either side of a mutual war will be able to retract the war at will, triggering the standard 24 hour cooldown before shooting stops. Mutual wars will also continue to end automatically if no PVP kills have occurred between the two sides in the last 90 days. We are also planning a series of improvements to the war declaration UIs in the May release. These changes are still at an early stage so we don’t have any pictures for you yet, but we’ll keep you updated as we get closer to the release. We are currently planning a UX pass on the “wars” tab in the corporation window, an improved user flow for declaring wars, a rework of the war report UI, and UI elements to indicate when you are in a war in case you’ve forgotten since you received the notification. It’s been a while since the various war declaration UI elements were refreshed so we hope to make some significant improvements in this area over the coming months. The April and May releases will also contain more bug fixes and small tweaks as we work towards the best war declaration system possible. We want to give a special thank you to all the players who have been submitting bug reports when they encounter issues with the war declaration system. Your bug reports have been invaluable in tracking down and solving wardec issues in recent months and we will continue to put special focus on the wardec bug reports between now and May. We want to hear from all of you in the feedback thread for this blog. Let us know how you’ve been experiencing the results of the December changes and what you think about the changes planned for this spring! Keep passing along your opinions through the forums, social media, your CSM representatives, and in person at World Tour events. The community’s feedback has played a major part in the development of these plans so far and that absolutely will continue. As I mentioned above, the collection of loophole fixes slated for the March release are available for testing on the Singularity test server right now and we encourage all of you to poke holes in them and let us know what you find. We’ll be continuing to keep you updated on the progress of this plan in the coming months as well as informing you of changes we make to the plan along the way. Thanks for following along with today’s dev blog, and good hunting! I will continue to just dock up. No interest at all in hisec wars. Its just a nuisance. 12 year vet. That is something may all understand and know. Usually comes from newcomers intending to determine what functions best and prompt. It lets your potential customer see in order to know a person need are system. Which complex will not help you with improving the quality. Is this site dead? Just copy paste articles and no moderators to clean the spam from comments? I simply want to tell you that I am just beginner to blogging and site-building and definitely savored this web-site. Probably I’m going to bookmark your site . You surely come with beneficial articles and reviews. Thank you for revealing your web page. Nowadays computers and mobile phones are so prone to threats like viruses and hackers and accordingly it becomes important for a person to have a secured system, which would be safe enough from these viruses and hackers. Moreover, to make this thing possible, it is very important that a good antivirus be installed in your system. In addition, one of the best anti viruses which is present in the market right now for the people is this Trend Micro Antivirus Support. What blogs for political commentary would you advise me to review? Leave a Reply to Keldor Eternia Click here to cancel reply.